This week we have a Bumper edition of the Run Report. 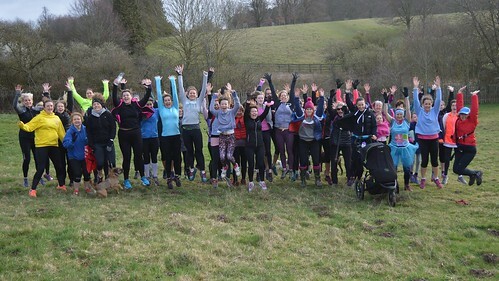 This Saturday we celebrated International Women's Day and being I was proud to be RD this week celebrating with the other 10.700 female parkrunners who have volunteered in the role of RD a massive combination of a total of 130,471 times. On this day we celebrated the 50th parkruns of Jose Hetherington and Caludia Selina, along with doing it for the boys Eddy Haddock, Luke Cobby and Max Elder earning their 10 shirts and Ben Patterson achieved his 100 shirt. 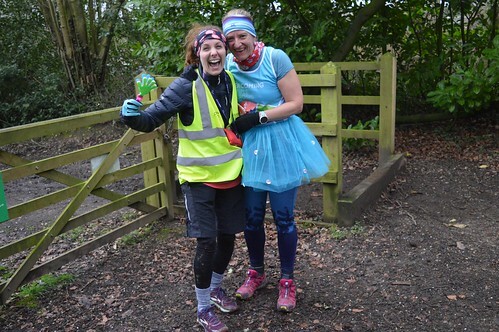 For the observant parkrunner you may have noticed Claudia running on Saturday in a blue tutu which was the raise awareness for Overcoming Multiple Sclerosis (OMS) as Claudia herself suffers with multiple sclerosis. Claudia has become an ambassador for OMS which is a non-profit organisation, which raises awareness about evidence based diet and lifestyle interventions that can improve health outcomes in people with MS. In Claudia's words "OMS gave me hope and positivity that I could make changes to the lifestyle I was leading for a better health outcome. 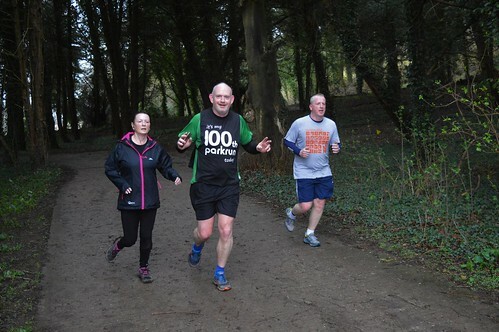 Since following the OMS programme, I have been healthier than ever before and it made me reconnect with running and finding parkrun. Mental health is hugely important and a healthier body leads to a healthier and stronger mind to enable you to deal with this curve ball that MS is. I am now one of the two ambassadors for the Hertfordshire circle and encourage everyone with MS to join their local circle. If you sign up on https://overcomingms.org/community/find-support/ you will find lots of local support to help you with this unpredictable condition. And as part of parkrun's PROVE project, there is also a great and inspiring community on Facebook for runners with MS. We have superquick sprinters amongst us, as well as MSers participating in their wheelchairs or solely by volunteering - everyone is welcome. Please pass on the news to anyone you know who is affected by MS."
Helen Page was away running a 50k ultra and so after 21 weeks, Holly Bunn becomes the final remaining member of our Year 5 100% club! 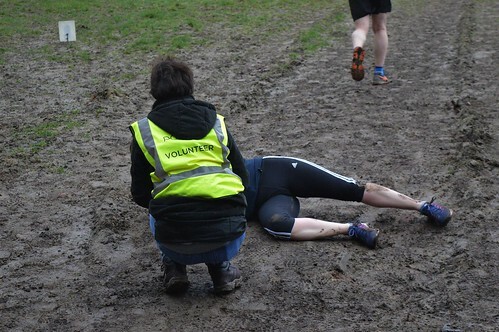 Helen’s sequence of 34 Tring parkruns in a row becomes the 4th longest ever sequence. Holly’s current 25 in a row, which is our current longest, sits just outside the all-time top10 for sequences. 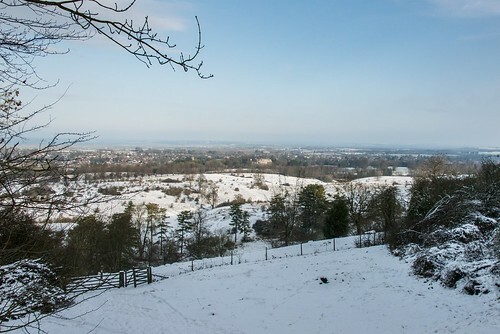 Last Saturday we welcomed 201 runners of which 21 where first timers with 31 PB's on the Tring Winter course. 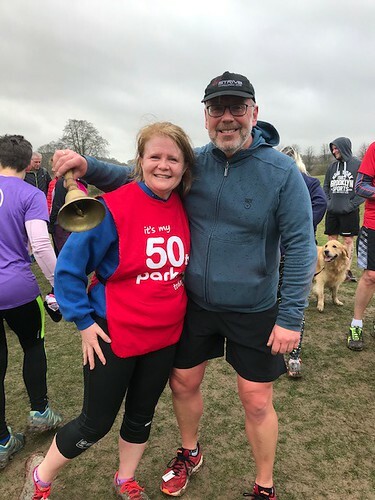 We have news of a new addition to the Tring parkrun family, you may have noticed that RD's Anna and Ross have been missing for a number of weeks. Well we are pleased to announce the birth of Jesscia Matilda Lambert and we are looking forward to seeing Ross and Anna doing a spot of buggy running. We also celebrated Colin Hamnett achieving his 50 shirt and Howard Lambert achieving his 100 shirt. 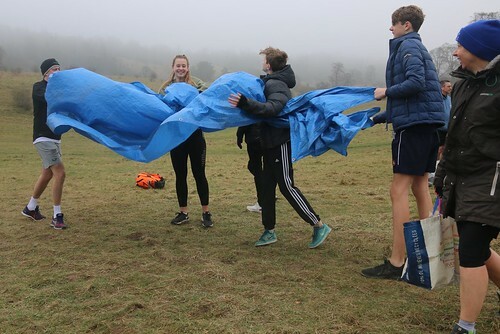 We arrived this week to a very foggy Tring Park despite the recent February weather giving us some record breaking temperatures and glorious sunshine. It wasn’t all gloom though as this week we heard that Anna and Ross Lambert announced the birth of baby Jessica. 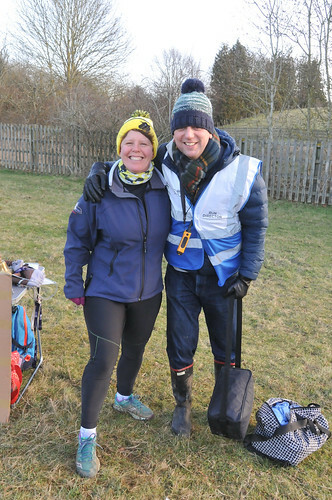 Anna and Ross are regular Tring park runners and volunteers and part of the RD team. Congratulations to you both and a big parkrun welcome to Jessica. 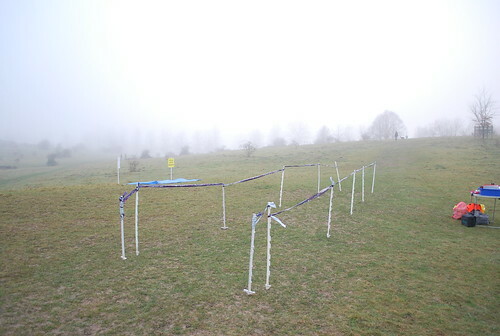 A very foggy finish line. 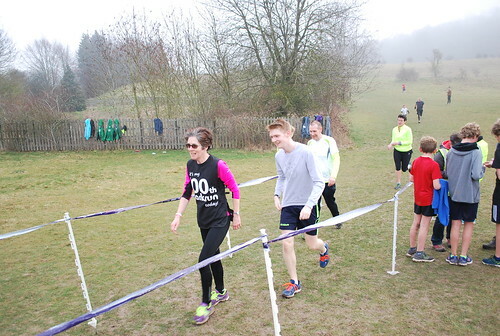 We welcomed 26 first timers to Tring this week with 7 people running their first ever parkrun. Lets’ hope we see you back soon to go for your first PB. Not sure if it was due to the school half term but 5 of the 7 first timers were under 14! Great to see the juniors getting involved. A very youthful finish line crew. A huge thank you to this weeks’ volunteers Clare Murphy, Dominic Cecere, Edward Crane, Howard Lambert, Isobel Monks, Izzy BROOKES, James Elphinstone, James Foskett, James Maple, Janice Lorimer, Julian Crane, Katie Haines, Marcus Birch, Oliver West, Patrick McLoughlin, Richard Alcock, Richard Murphy, Robert Alcock, Roberto Cecere, Samuel Fryer, Sarah Foskett, Shelley Deverall-Roberts, Thomas Page and Tom Foley. 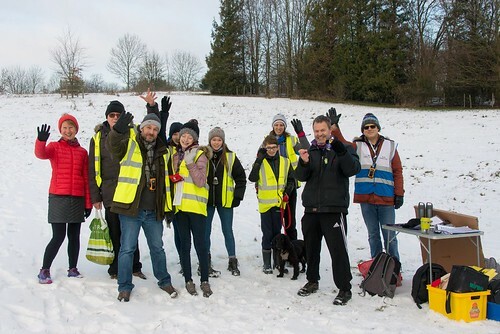 We had a great finish line crew with predominantly DoE volunteers who did a great job making with timing and scanning. Although we did have some issues with the results later in the morning which did take some sorting out. All good now though! Juliet and husband Greg in her 100 tabard and on the finish line with son Ben. 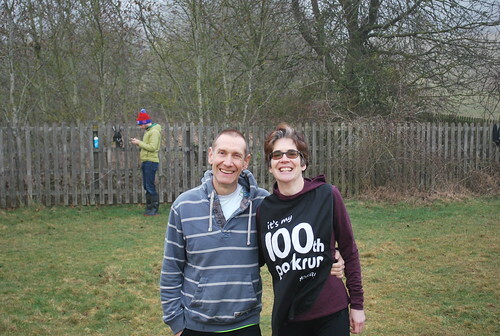 Just two milestones this week with Juliet Mitchell running her 100th parkrun and Adeline Lawley completing her 50th. Congratulations to you both and we hope to see you in your shiny new T-Shirts soon. 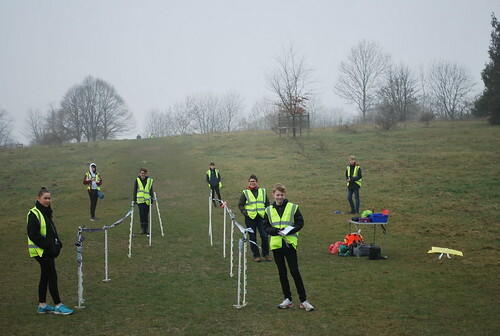 We had 216 runners this week and despite the foggy conditions there were 41 Personal Bests! First across the line this week for the ladies Zoe Chamberlain in 23:11, with Olivia Clarke next on 23:58 and a new PB followed by Emma Smith in 24:32. For the men Matt Wade was fastest with a new PB of 18:31 followed by Guy Dauncey in 19:59 also with a PB and first timer Lee Cahill in 20:09 and Jhon Cosgrove in 19:13. And now the infamous Tring parkrun weekly stats! 1). The 3rd time that we have had 2 successive parkruns with the same attendance and each time it has happened, the fastest finisher has been the same in both weeks! 2). 3PBs in 3 weeks for 3 members of the same family so well done to, Deborah, Richard and Jacob Lea. Did you know February 16 is the 47th day of the year in the Gregorian calendar? 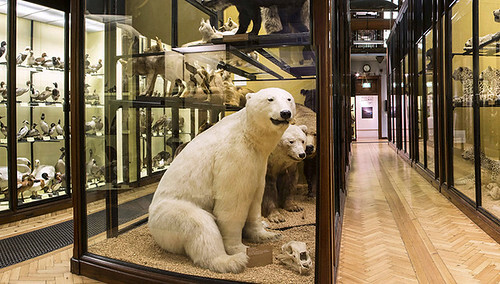 Did you know there are 318 days remaining until the end of the year (319 in leap years)? Did you know that in the year 600 Pope Gregory the Great decreed that saying "God bless You" is the correct response to a sneeze? With Hump Day done and into Thirsty Thursday, we’ll soon be on to the best day of the week Friday (aside of Parkrun Saturday of course!). Friday of course is known to some of us as something else completely, just to say has something to do with poems and leaving work early. I’m afraid time as has caught with me this week and this report will be (mostly) based on our world-renowned stats. First off, this week saw a couple of juniors join the ‘10 club' - Dominic Cecere and Jack Brown. Dominic has completed all 10 of his runs at Tring. Jack has completed 9 at Tring and one at Wycombe Rye, Jack also celebrated with a new PB, making that 6 PB’s out of 10 runs. While we’re on Personal Bests: we had 3 in 3 weeks for Mike Holdroyd (also his fifth in five visits), 2 in 2 for Jack Brown and a great piece of family teamwork with 2 in 2 by Richard, Deborah and Jacob Lea. 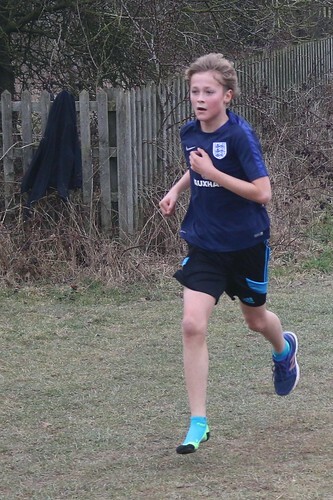 In addition, Richard Caseley is on a sequence of 7 PBs in his last 7 Tring visits whilst Rob Firth and Sammi Hicks are on sequences of 3 each and with precision running Anna Cuthbert equaled our JW11-14 record of 21:10. Next is a stat that you don’t see too often is the fastest finisher to finish wearing one shoe! Is that the fastest or the only one? Either way good effort. The mysterious case of the lost running shoe. 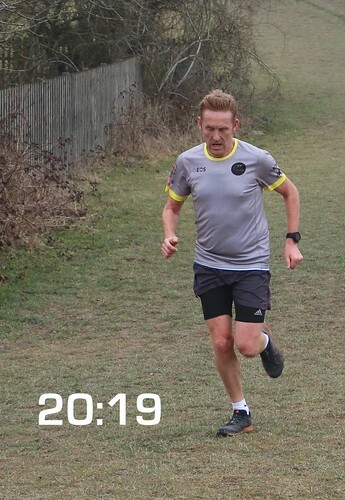 We’ve waited for a few weeks for this next stat but this week John Mayock recorded our first 20:19 in 2019. 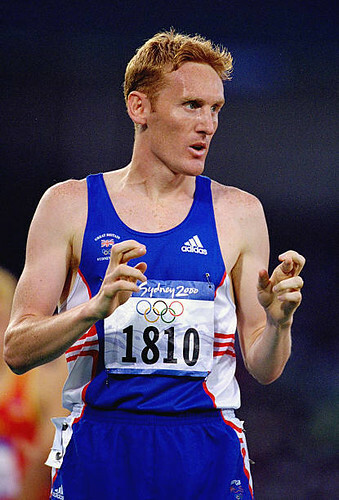 Of all those who have run at Tring, John probably holds the record for having the run the fastest 5k at some point in their life with his time of 13:19 at The Commonwealth Games in 2002. Obviously if any of our regulars have gone faster, please let us know! John became the first runner in 2019 to record a time of 20:19. He is one of two Olympians running with us at Tring regularly. He represented his country at the 1996 games in Atlanta, the 2000 games in Sydney and the 2004 games in Athens. Paul Crudge becomes the 143rd person to run 50 times at Tring. Who will be our 150th to 50 I wonder? 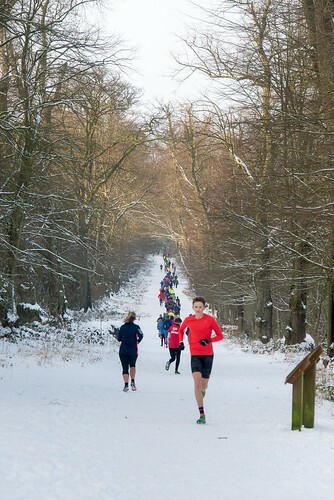 Tring Parkrunner Jose Hetherington has been organizing monthly touristing trips and this week they were at Cassiobury. As a result our Tring year 5 100% club is now down to just 2 members, just Holly Bunn and Helen Page have been ever present at Tring since our birthday at the beginning of November. We saw 2 Leons. Katharines and Euans for the 2nd time and we also welcomed new names Oakley and Dayo. 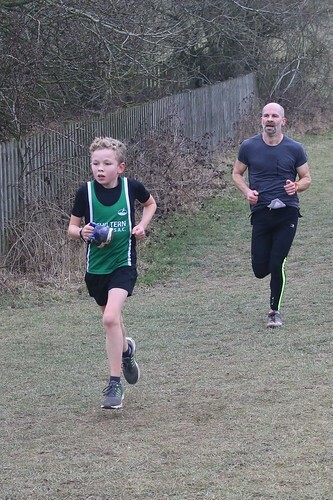 It’s not often in February that a minute beats it’s attendance record but that’s what happened to minute 20, ably assisted by some Chiltern Harriers juniors to a total of 12 runners beating the previous 10. 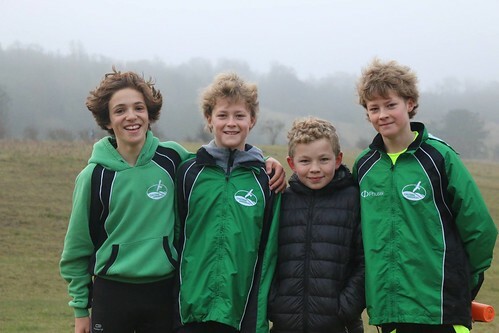 The biggest improver of those who have run more than 5 times at Tring, Deborah Lea (2:18), Christine Dennis (2:11), Oliver Page (1:50), Christopher Ireson (1:45), Talia Williams (1:43) and Oliver Ireson (1:35) and Jack Brown. Jack you’re almost famous, mentioned 3 times in one report! Thank you to all the volunteers who helped out and responded to the midweek plea. 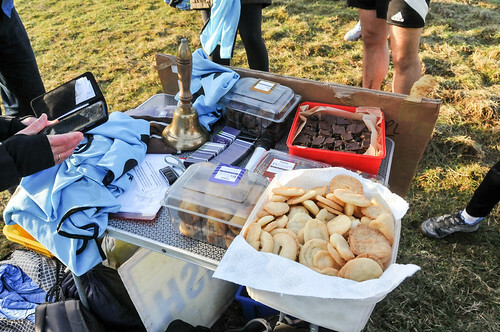 This week 216 people ran, jogged and walked the course, of whom 26 were first timers and 55 recorded new Personal Bests. Representatives of 18 different clubs took part. 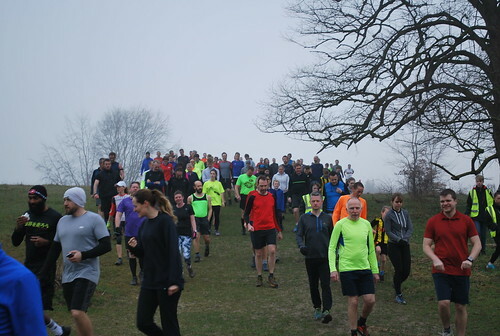 Tring parkrun started on 1st November 2014. 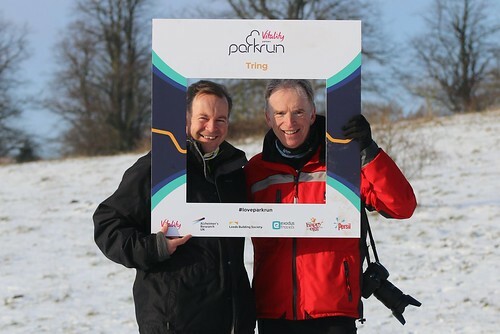 Since then 6,920 participants have completed 42,114 parkruns covering a total distance of 210,570 km, which is approximately 5 and quarter times around the world.